Check it out: Windsor, Ontario, Canada is just south of Detroit, Michigan, USA. The Windsor Star has an article about the Shroud of Turin exhibit coming to Windsor, which is inexplicably to be found in the paper’s Health News section. The controversial Shroud of Turin exhibit, which has intrigued religious and secular minds for centuries, is coming to Windsor for several weeks of public viewing. I know I’m being picky but it is the Shroud of Turin that is controversial and has intrigued religious and secular minds for centuries. One of many exhibits about the shroud is coming to Windsor. Religious believers say the shroud’s bloodstains clearly depict the flogging, spearing, coronation and crucifixion of Jesus. Others, who focus on carbon dating evidence, believe the cloth was a clever medieval prop created around the 14th Century. For years I was a religious believer who assumed the shroud was a 14th Century fake relic. Interestingly enough, when I focused the carbon dating evidence, I began to question what I assumed. My religious beliefs were such that I would have probably preferred that the shroud was fake. But that is another story. And that’s the point. You can’t so categorize people. Most of his life? Really? Was this quote checked? 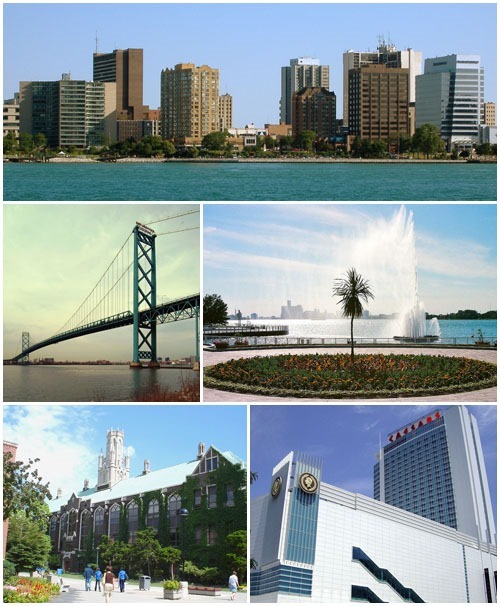 Note: Montage of free-use images of Windsor, Ontario from Wikipedia. Don’t be so hard on press hyperbole. Barrie can speak for himself but the facts, as he reported in the BSTS Journal and other places are that as a Jew (whether observant or not) he was reluctant to get involved with a “Christian” relic. One colleague, who was also Jewish (Don Devan) convinced him that because they were Jewish and had no one would expect them to have a bias toward authenticity. There are a lot of things the press has gotten wrong about the Shroud at various times. Don’t be too hard on a reporter for a little hyperbole because the essence of what he was reporting is true: Barrie approached the Shroud as a skeptic and had lingering doubts of authenticity for many years after. He was also a skeptic of the carbon dating because on thing h did know from the STURP examination: the Shroud was not a painting. I certainly hope the pseudo-skeptics who sometimes populate this blog don’t use your post as an excuse to launch any attack on Barrie or the press. By the way, all of this is covered in detail my book Quantum Christ: Chapter 11: “The Return of Ray Rogers.” See http://johnklotz.blogspot.com for details. The hyperbole hides the fact that Barrie always approached the subject of authenticity with admirable objectivity. (and certainly, often, I am reduced in these conditions! …). This is one of the reasons why I prefer nano-analyses non-destructive. the bloodstains of the Shroud by Jesus? Don’t we should perhaps really rely on the Medical Robots for future reverent (and high-tech) nano-analyses?